So you have tons of ideas running around your head but don't know how to turn them into a business. Or maybe you've always wanted to start a business but have a hard time coming up with a solid idea. 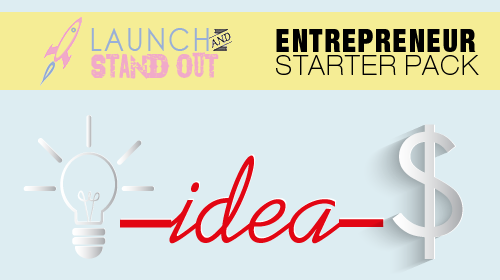 Well the Entrepreneur Starter Pack is for you. You will get access to a digital copy of Launch and Stand Out which will teach you...How To Launch Your Ideas Into Profitable Businesses. And How To Stand Out With Marketing & Branding To Position Your Products/Services Above The Crowd. You will also get access to a course that shows you How To Start a Business From Home. Your subscription will also entitle you to one new e-book per month on the topics Entrepreneurship, Marketing, Branding or Sales. Plus as an added bonus you will get access to the "Start Where You Are" video series which is designed to give you the confidence you need to succeed starting now.